Interstate 37 north at the four-level interchange with IH 410 (Connally Loop) and U.S. 281 in south San Antono. Photo taken 09/29/07. 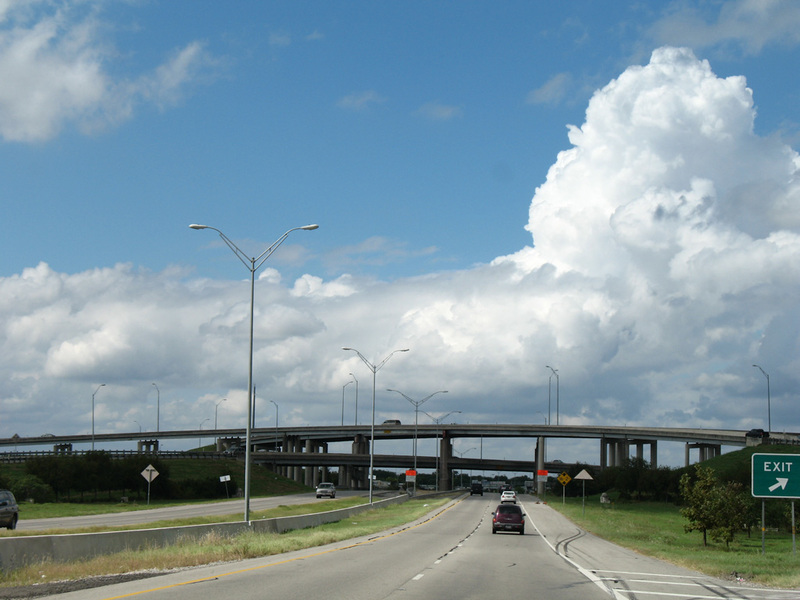 Interstate 37 provides a link between San Antonio and Corpus Christi in South Texas. Like Interstate 45, IH 37 is entirely located within the Lone Star State. The freeway also provides part of through route to the Rio Grande Valley via connections with U.S. 281 / Interstate 69C and U.S. 77 / Interstate 69E. IH 37 is also one of the only limited-access routes available during a hurricane evacuation situation, being the main escape route from the South Texas coastline inland towards San Antonio and Austin. Interstate 37 combines with U.S. 281 south from its independent freeway through north San Antonio to Downtown and Interstate 410 in southeast San Antonio. U.S. 281 shifts westward along IH 410 to its parallel alignment to IH 37 south to Leming and Pleasanton. The two come together again between Exits 103 and 72 near Three Rivers. U.S. 281 branches south from there toward Alice while the remainder of IH 37 mirrors the course of U.S. 181 southeast to Corpus Christi. U.S. 77 also briefly ties into Interstate 37 at Robstown and Interstate 69E. 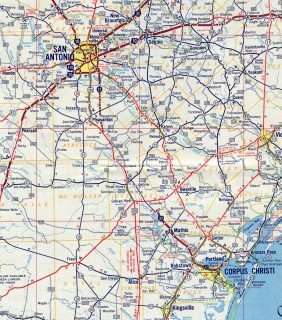 Interstate 37 was completed from San Antonio south to FM 1303 (where Loop 1604 crosses IH 37 now) by 1972 and from Corpus Christi north to FM 534 at Swinney Switch. Interstate 37 & U.S. 281 north ahead of FM 541 near Liveoak Creek in Atascosa County. Photo taken 09/29/07. The U.S. 181 Harbor Bridge Replacement Project, an $899 million span planned to replace the 1959-built bridge for U.S. 181 to the east, broke ground on August 8, 2016.1,2 Four Proposed Build Alternatives were considered as of July 2013. The Red Alternative was ultimately chosen. It ties in the new 538 foot tall cable-stayed bridge2 and alignment with the IH 37 interchange with the Crosstown Expressway (SH 286). Redesign of that exchange will replace the current design with a new directional T interchange with high speed flyovers between north-south U.S. 181 / SH 286 and IH 37 to the west. Connections with the IH 37 spur to the east will use the frontage roads in place of direct ramps. The proposed section of Interstate 37 north of Downtown San Antonio to Interstate 410 was first planned as the North Expressway, a route connecting Downtown with the airport. Original plans called for the freeway to travel a straight line north from Downtown. However, local opposition arose due to the potential local impacts of the freeway. 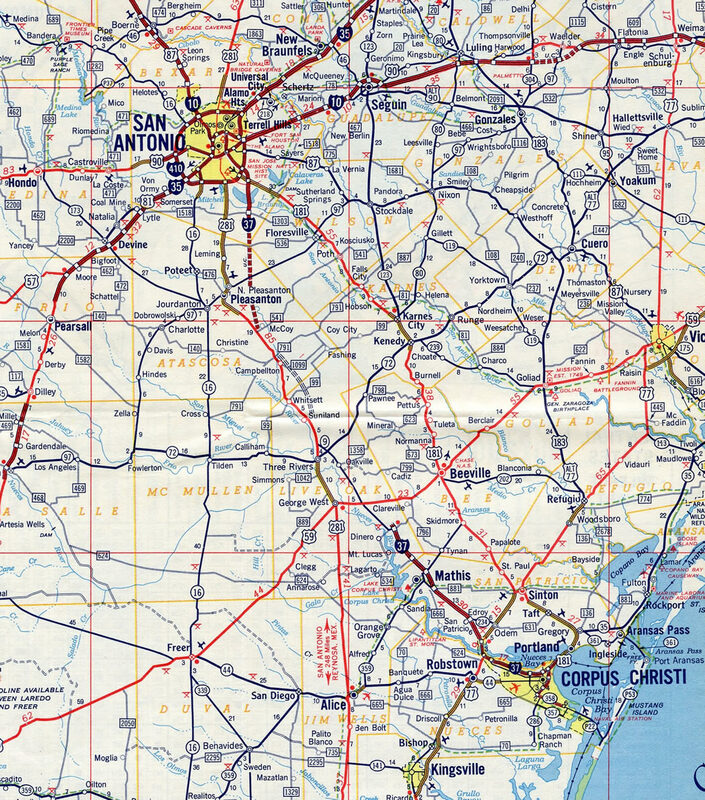 A lawsuit by the San Antonio Conservation Society resulted in an injunction preventing construction of the freeway as an Interstate in 1967. Opposition to the freeway project remained through the late 1960s and early 1970s. The struggle reached a national audience when the freeway was profiled in Helen Leavitt’s book Superhighway-Superhoax. With its proximity to or passage through parkland, a college campus, schools, residential areas and other sensitive areas, the route was changed to avoid these features. This helps explain the many curves of the freeway between Interstates 35 and 410. In 1973, the freeway was resurrected as a project to be built as U.S. 281 and without federal funds (and therefore not as part of IH 37). Construction ensued through the mid-1970s, and the Walter McAllister Expressway (U.S. 281) opened to traffic on February 7, 1978.4 The interchange offering direct connection ramps between U.S. 281 and Interstate 410 did not begin construction until 2006. Traveling between the Alamodome and the Henry B. Gonzalez Convention Center, Interstate 37 & U.S. 281 north reach the final mainline off-ramp (Exit 141) for Commerce Street to Downtown San Antonio. Photo taken 09/29/07. Interstate 37 wraps around the east side of Downtown San Antonio along a viaduct system to the systems interchange (Exits 142A/B) with Interstate 35. Photo taken 09/29/07. Exit 142A departs next for IH 35 heading east to IH 410 and north to Austin and Dallas/Fort-Worth. Photo taken 09/29/07. U.S. 281 extends the freeway from IH 37 north eight miles to San Antonio International Airport (SAT) at IH 410 and 14 miles to Loop 1604 (C.W. Anderson Loop). Photo taken 09/29/07. Button copy guide signs for Interstate 35 and the Commerce Street exit along IH 37 & U.S. 281 north. Photo taken 12/30/02. Traffic from Commerce Street entered IH 37 north on the half mile approach to IH 35. Photo taken 12/30/02. Back to back lane drops at Exit 142 leave the northbound mainline with three lanes for the continuation of U.S. 281. Photo taken 12/30/02. Lane control arrows below overheads for U.S. 281 and Interstate 35 can be adjusted based on traffic conditions. These were posted on sign bridges throughout the San Antonio metropolitan area. Photo taken 12/30/02. 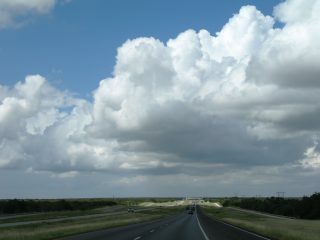 Exit 142A parted ways with IH 37 & U.S. 281 north for IH 35 north 70 miles to Austin. Photo taken 12/30/02. A left-hand ramp (Exit 142B) joins IH 35 south around the north side of Downtown San Antonio. IH 35 combines with IH 10 west of the central business district, while IH 10 leads northwest to Kerrville and Junction. Photo taken 12/30/02. Interstate 35 south at the Walters Street overpass, prior to an expansion project that added a lane to each direction. The initial signs for IH 37 south and U.S. 281 were removed. Advance notice for southbound drivers appears a half mile ahead near the New Braunfels Avenue over crossing. Photo taken 09/28/07. The New Braunfels Avenue off-ramp was relocated eastward to depart ahead of Frank Street as part of the IH 35 widening. The freeway proceeds west 0.75 miles to Exit 158B for IH 37 south to The Alamo and Downtown. Photo taken 09/28/07. Changes made to Exit 158B by 2016 restriped the off-ramp to just one lane for Interstate 37 & U.S. 281 south to Corpus Christi. Photo taken 09/28/07. Interstate 37 separates from Interstate 35 as both encircle Downtown San Antonio. U.S. 281 travels 61 miles north from Exit 158A to Johnson City in Blanco County. Photo taken 09/28/07. The first set of guide signs for Exits 158B/A of Interstate 37 south and U.S. 281 on Interstate 35 south. Interstate 35 has just left a brief overlap with Interstate 410 at this point. Photo taken 12/30/02. A new on-ramp merges onto IH 35 south where Exit 159A used to depart for New Braunfels Avenue. The north end of IH 37 lied three quarters of a mile beyond this set of non reflective overheads. Photo taken 12/30/02. Exit 158C parted ways with Interstate 35 south for the adjacent frontage road leading west to Loop 386 (Broadway Street). Broadway Street is the historic route of U.S. 81 leading south into Downtown San Antonio. Photo taken 12/30/02. Two lanes were allocated for Interstate 37 & U.S. 281 southbound from Interstate 35 south until 2016. The north-south freeway straddles eastern reaches of Downtown to the Alamodome. Photo taken 12/30/02. Like IH 10 heading northwest to IH 410, IH 35 separates into upper and lower levels. The lower level constitutes a four-lane grade level freeway while a system of three-lane viaducts carry the upper level to IH 37. Photo taken by Chris Patriarca (06/24/03). The upper level of IH 35 provides an express route to IH 37, while the lower level sees local access to the adjacent street grid. Photo taken by Chris Patriarca (06/24/03). The lower level lanes emerge just ahead of the directional interchange (Exit 158) with IH 37 south and U.S. 281. Photo taken by Chris Patriarca (06/24/03). Exit 158 carries traffic to both Interstate 37 & U.S. 281 south to Corpus Christi and the Rio Grande Valley and U.S. 281 (McCallister Freeway) north to SAT Airport as the IH 35 mainline continues east with three through lanes. Photo taken by Chris Patriarca (06/24/03). Exit 158 partitions into a local ramp for SL 386 (Broadway Street), which threads through the exchange at grade level along the historical route of U.S. 81. IH 37 and U.S. 281 overlap for nine miles south to IH 410. Photo taken by Chris Patriarca (06/24/03). Heading east from the Crosstown Expressway (SH 286) south, IH 37 sees back to back ramps for Buffalo Street (Exit 1A) and U.S. 181 & SH 35 north to the Harbor Bridge. The U.S. 181 Harbor Bridge Replacement Project will lower Staples Street here to grade level and reconstruct the remainder of the freeway east into an at-grade boulevard. Photo taken 09/29/07. All ramps associated with the directional T interchange joining IH 37 and U.S. 181 & SH 35 north will be demolished. Broadway Street will be redesigned as a six-lane boulevard in place of the Harbor Bridge approach. Photo taken 09/29/07. Interstate 37 south extends east from the U.S. 181 flyover with two lanes for another quarter mile to Mesquite Street. Photo taken 09/29/07. Ramps from U.S. 181 & SH 35 south partition above the ending freeway for Broadway Street south and Twigg Street east to Shoreline Boulevard and the Corpus Christi waterfront. Photo taken 09/29/07. Interstate 37 ends as a four-lane boulevard extending three blocks east from Mesquite Street to North Shoreline Boulevard and Corpus Christi Bay. Photo taken 09/29/07. SH 286 ends at the ramp split for IH 37 north to San Antonio and south to U.S. 181 (Harbor Bridge) and Shoreline Boulevard. With the new Harbor Bridge approach tying into this exchange from the north, all ramps here will be replaced as part of an interchange redesign. Photo taken by Jeff Royston (12/00). Former button copy sign posted ahead of the U.S. 181 & SH 35 northbound off-ramp from IH 37 south. The Harbor Bridge carries both routes across Corpus Christi Channel to North Beach, where the Texas State Aquarium and the U.S.S. Lexington are located. State Highway 35 branches northeast from U.S. 181 in ten miles en route to Aransas Pass and Rockport. Photo taken by Jeff Royston (12/00). Milepost zero preceded the flyover for U.S. 181 & SH 35 north from IH 37 south. The assembly was removed in 2016. Also ending here are U.S. 181 and State Highway 35. Historically U.S. 181 ran three blocks to the east along Water Street. Photo taken by Jeff Royston (12/00). Non reflectorized signs directed traffic to U.S. 181 & SH 35 north to Portland and to the Interstate 37 boulevard east to Shoreline Boulevard and Bayfront Plaza, the previous name of the American Bank Center convention center and arena. Photo taken by Mike Wiley (09/00). U.S. 181 and SH 35 southbound conclude as traffic separates into ramps for the Corpus Christi Port Area to the northwest, Interstate 37 north to the Crosstown Expressway and Broadway Street south into Downtown. Photo taken by Mike Wiley (09/00). Trailblazers for IH 37, U.S. 181 and SH 35 north were formerly posted at the intersection of Shoreline Boulevard north with the Interstate Highway 37 boulevard extending west to the freeway. The terminus of IH 37 is a rare example where an Interstate, U.S., and State Highway all conclude at the same location. Photo taken by Jeff Royston (12/01). Interstate 37 stems west from Shoreline Boulevard as a four-lane landscaped boulevard three blocks to Mesquite Street. The freeway commences and splits with a northbound on-ramp for U.S. 181 & SH 35 to the Harbor Bridge and Portland. Photo taken 09/29/07. Flyovers join Interstate 37, U.S. 181 and SH 35 at Broadway Street. This exchange will be demolished and IH 37 redesigned as a surface boulevard westward to the Crosstown Expressway was part of the Harbor Bridge Replacement Project through 2021. Photo taken 09/29/07. The initial stretch of IH 37 north travels below grade between Downtown Corpus Christi and Martin Luther King Drive. Ramps join the freeway from U.S. 181 south and Padre Street as the freeway progresses west a quarter mile to SH 286 (Crosstown Expressway) south. The forthcoming exchange with SH 286 will be redesigned to accommodate the new Harbor Bridge approach. Photo taken 09/29/07. “Harbor Bridge open house to show possible bridge modifications.” Corpus Christi Caller Times, June 23, 2016. “Groundbreaking ceremony held for Corpus Christi Harbor Bridge.” Rio Grande Guardian (TX), August 9, 2016. Page updated August 30, 2017.